His compatriot, Laurent Garnier, will also be part of our second edition. While this DJ has recorded his name in the Olympus of electronic music, the contribution of Garnier has transcended far beyond the cabin. He is responsible for having ignited the spark of techno throughout Europe, and since then, he has been in tune with the energy of the dance floor for more than 30 years. The journey continues through evocative, extremely nostalgic old school sound and worn-out lo-fi of Ross From Friends, who lands for the first time in Madrid with his first LP Family Portrait (Brainfeeder, 2018). Also for the first time in the main city, Kampire joins the line up. This DJ is at the forefront of the country’s dance music from the key label and collective Nyege Nyege Tapes, the seed that’s revolutionizing and inspiring crowds in this scene unknown to Western culture. Polyrhythmic percussions, catchy voices, booty and tropical bass that you will not forget. 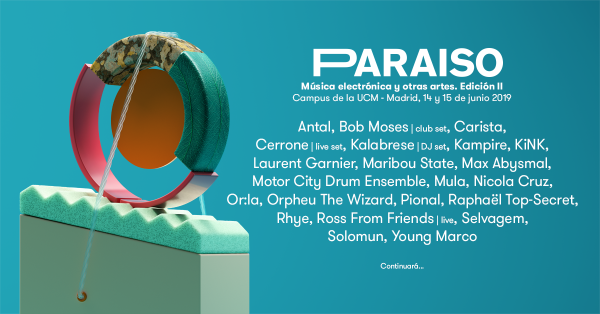 Antal, Bob Moses, Carlist, Cerrone, Kalabrese, Kampire, KiNK, Laurent Garnier, Maribou State, Max Abysmal, Motor City Drum Ensemble, Mula, Nicola Cruz, O: la, Orpheu The Wizard, Pional, Raphaël Top Secret, Rhye, Ross From Friends, Selvagem, Solomun, Young Marco and many more are waiting for you to dance like never before on June 14 and 15. Get your two day ticket before the next change on price, on February 11 at 11:59 p.m. (CET).